We were made to be resilient. I saw it gardening today. A tiny green leaf grasped for life, just as I bent to throw - what I thought was a plant hit by hail and frost - a plant that was surely dead aside. While on the surface there appeared to be no life, beneath the dried out, crusty, brown leaves was a plant saying yes to life. I saw resilience as I cut my husbands hair today. A month after his last chemotherapy treatment his hair is thickening and darkening again. There is life in follicles that seemed gone. His body is embracing the life that we hope his treatment has given him. Every cell is choosing to live. I saw resilience in the bible today. In the Psalms I was reminded that we are made to be resilient. I was reminded that we will survive the very worst days of our lives because at the end of it all God will take our tears and give us laughter, he will take our grief and turn it into wild dancing and weave flowers into our hair. 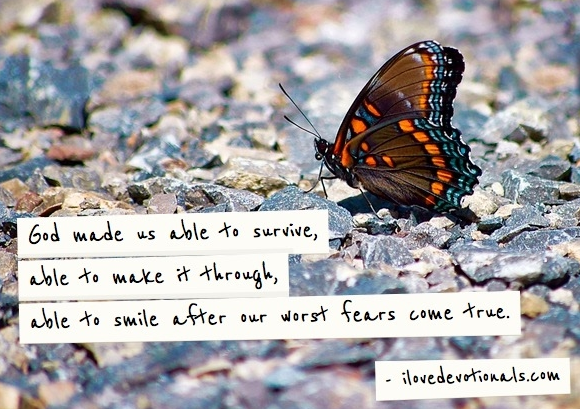 God made us able to survive, able to make it through, able to smile after our worst fears come true. And if today all you feel like doing is crying your eyes out - that’s okay. Just know that it won’t last forever, that it will give way to days of laughter, days where you will see little green leaves sprout, and when thanks will pour from your mouth because of the God who has brought you through. Today I want to thank God for showing me life in unexpected places. I want to thank God for holding my husband and I through chemotherapy and I want to thank Him for sustaining our lives. What has God brought you through that you can thank Him for today? You can share this devotional on twitter by clicking here. I’d also love for you to connect on my facebook and twitter pages or leave a comment below about what you are thanking God for today.